Whether you are on the hunt for a classic wedding chapel, a wild and colorful celebration station, or an urban airy art studio space, bay area venues will not disappoint. From the diverse landscape to the sprawling San Francisco cityscape, we love the variety of wedding and event venues offered in the area and we are excited to share them with you! The team at Marilyn Ambra Party Consultants has rounded up a list of some of our favorite selections to inspire your search for your wedding or next special event. Keep reading to see all the Bay area beauty! With a concert or film festival one day and a pristine wedding the next; The Chapel San Francisco never slows down and keeps its vibrant, historic doors open to all types of events. The historic 1914 building is a colorful space with a generous stage, a cozy full-service bar, and built-in restaurant that offers top-of-the-line catering and promises to meet all your culinary needs. With it's 40’ traditional arched ceilings and classic mahogany details, the venue offers a myriad of options and is the perfect place for your next event! Rich in history and perfectly perched in the hub of the city, the San Francisco Mint is as elegant as it is historic. The 92,000 square foot building was built with the goal of keeping up with a rapidly growing economy, and now it serves the city as a classical revivalist venue that specializes in high design events. With towering columns and expansive open spaces, the regal ceiling-to-floor marble atmosphere and historic design elements, along with the collection of intimate rooms will make for an urban experience your guests will never forget. 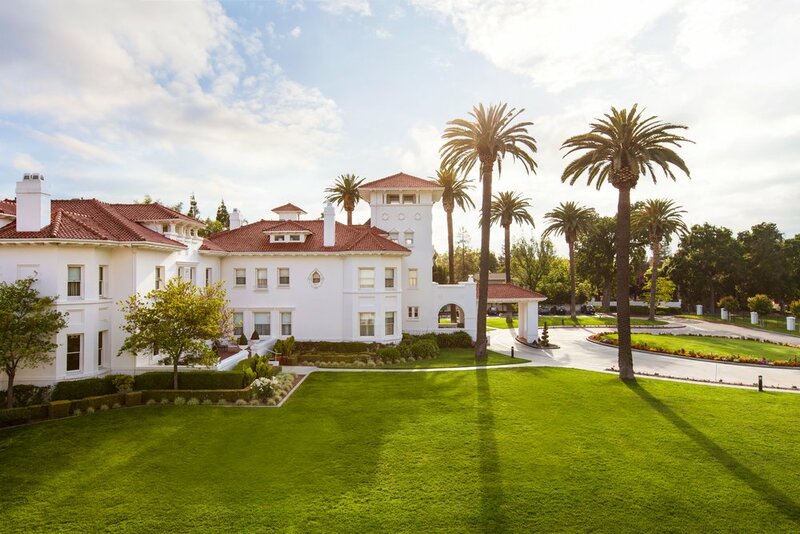 The Historic Dolce Hayes Mansion boasts being one of the South Bay's most impressive and distinctive historical structures. Located immediately adjacent to the picturesque Edenvale Regional Gardens, the property has created its own oasis like a retreat in the middle of San Jose. Timeless architectural style combined with classic and perfectly manicured lawns and gardens create a historic and distraction free experience for guests no matter the intention of their stay. After being rebuilt upon it’s shattering earthquake demolition, San Francisco City Hall is a regal destination of resilience. It is affectionately known as the “people’s palace” and boasts being the crown jewel of San Francisco’s event venues. Complete with the breathtaking rotunda and marble grand staircase, as well as the light-filled South and North courts, San Francisco City Hall is a stately venue and is perfectly tailored for your next wedding or gala. Comprised of two distinct levels, Terra Gallery is a modern venue that provides a blank canvas for any event. The bottom level, Mer, features large windows to bring in natural light and built-in details like a wooden stage and sculpturesque serpentine bar. Moving upstairs, Terra initially opens into a classic gallery space dotted with white columns, white brick walls and classic gallery lighting. As you travel further into the space and behind the dividing drapes, you’re greeted with large floor to ceiling warehouse windows, high ceilings and lovely city views. The distinct differences between Mer and Terra create two unique experiences and atmospheres that can be utilized to achieve your dream wedding or event design. Located in the lush greenery of the Oakland hills, the Dunsmuir Hellman Historic Estate is a hidden treasure in the bay area. The grand white estate stands in splendor, surrounded by 50 acres of vibrant green lawns and rolling hills - that are guaranteed to steal your heart. Charming and nostalgic, the 16,224 square foot Neoclassical Revival mansion sees events of all kinds and will give your wedding, lavish picnic or grand party a special touch. The Bently Reserve is a event planners dream. With 11 versatile spaces ranging from boardrooms for small meetings, to the Adriatic room as a blank canvas space and the piece de resistance -The Banking Hall for larger events. The majestic marble columns and vaulted ceilings in the Banking Hall are a perfect fit for weddings and events creating a beautiful backdrop not only for the reception but for the ceremony as well. The diverse styles, designs and purposes for each space creates a wonderful venue that truly does meet the needs of most events. As one of the most revered San Francisco Museums and sought-after event venues in the Bay Area, the Legion of Honor sets the stakes high with their effortless elegance and class. From the picturesque pillars to the breathtaking views of the San Francisco Bay including the Golden Gate Bridge as well as beautiful parks and golf courses with sprawling lawns. The outside views are not the only captivating aspect to the Legion of Honor; inside it is home to everything from ancient art to modern photography that guests can enjoy prior to your event. With the ability to host your event anywhere from the galleries to the outdoor courtyard the Legion of Honor is a jaw-dropping venue that guests just love!